The Battle of Pelennor Fields was the biggest and most important battle in the War of the Ring. This battle was more than a battle for the city of Minas Tirith, but a battle for all of Gondor. It was massive, bloody, and high in casualties. Among them was King Theoden, who fought gloriously and defeated the Black Serpent, and the Witch-King of Angmar, Sauron’s second in command. 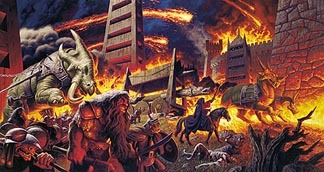 Greg and Tim painted this second version of the siege for publication in their book published in 2000 titled, Greg and Tim Hildebrandt: The Tolkien Years – Expanded Edition. The art was also used as a pullout poster. Created by Greg and Tim Hildebrandt in 2000.